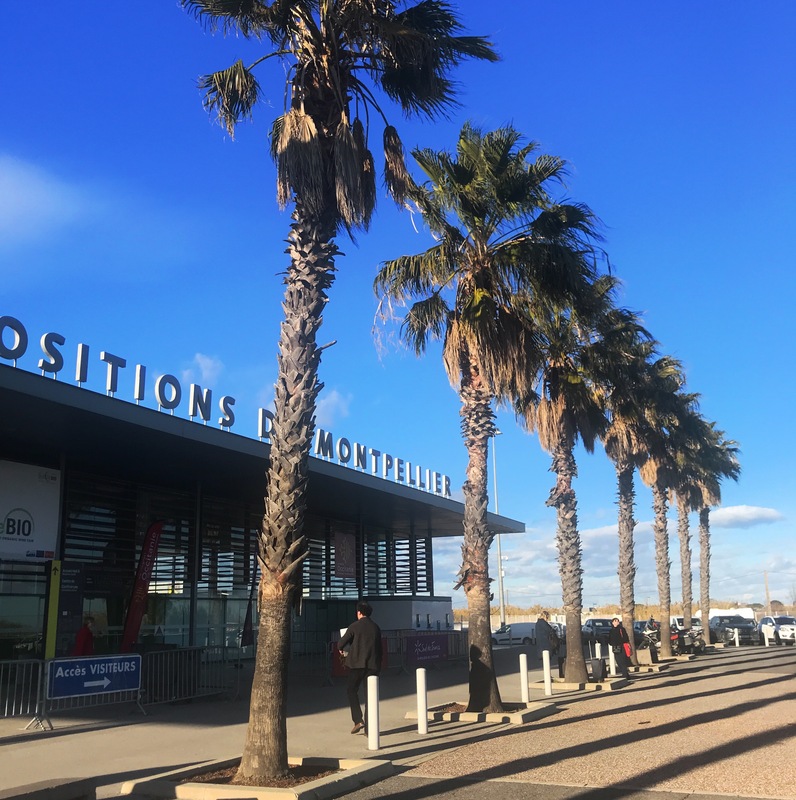 Touching down at the Millésime Bio organic wine fair in Montpellier. Sunshine. Organic wine. 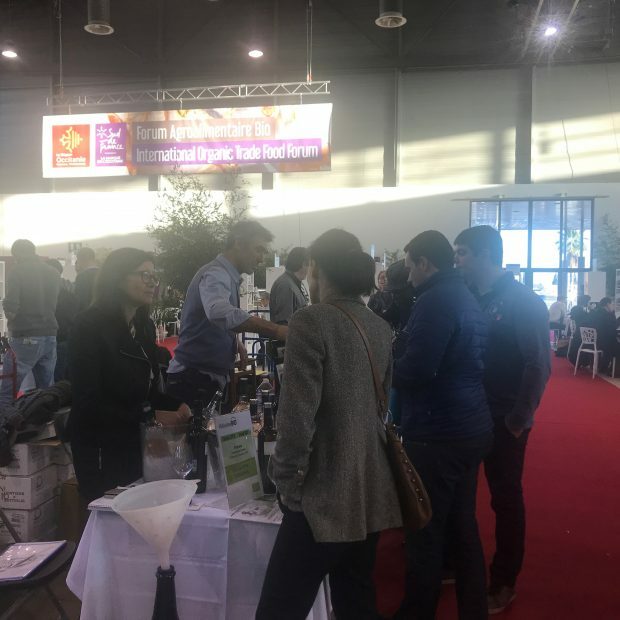 It did not take much cajoling by SudVinBio to accept the invitation; over 1,200 organic wine exhibitors from 22 different countries under the mild Mediterranean sun. In its 26th year, Millésime Bio comes of age. Today it is a smooth modern event. Happily, there are still some tell-tale signs that it it true to its 1990s roots, a time when organic wine was more fringe than it is today. The layout for the tasting is egalitarian. Each winemaker’s table was presented simply with a white table cloth, which featured one or two producers. This was repeated for all the winemakers over four huge halls. I even saw one winemaker with just one bottle of wine to show. Not much marketing, no massive winery stands, no sign posts showing regions. At first, the four large halls felt overwhelming (how are we going to find the wines from this or that region? ); after a few hours, it felt refreshingly democratic. To navigate around the event I downloaded the app to find different regions and producers (rather than the brick of a guide, which was a waste of paper if you are using the app. Go digital, people!). Who knows what wine you will discover? A majority of the winemakers were family-run, small producers. This flat structure of the event gave each producer an equal platform to be heard. In 2045, will a wine fair for organic wine even be necessary? Or, will the majority of wine be organic wine anyway in twenty-six years time? If trends continue, there could be over 1 million hectares of organic vineyards worldwide based on IWSR projections to 2022. Will wines even be physical, can they become replicated in a virtual space? In 2045, you can have a convincing smell of cassis and oak by shining light pulses at different wavelengths. Or perhaps at the other extreme, wines will it become even more unfiltered and organic. The thrill for wine drinkers of 2045 is its un-virtual reality, much like how inner-city children, who have never stepped foot in a farm, feel like at a travelling baby animal show. Twenty-six years ago in 1993, a young winemaker who wanted to practice organic winemaking often had to argue with his parents and grandparents to change their ways to their organic and “riskier” form of agriculture. The post-World War Two generation saw petro-chemicals as the gift of consistency, cash flow and food on the family table. Back to the future, in 2045, the earth is full of residual chemicals that it just can not take any more even you could buy them. Will our Earth exist in 2045? What will happen to traditional viticulture and agriculture? Let’s drink well today and go lightly forward, towards a more hopeful future. Organic wine is only beginning. There’s a lot more to do. For more thoughts and facts on the EU regulations, see my previous post, What does organic wine mean today? Previous PostWhat does organic wine mean today?